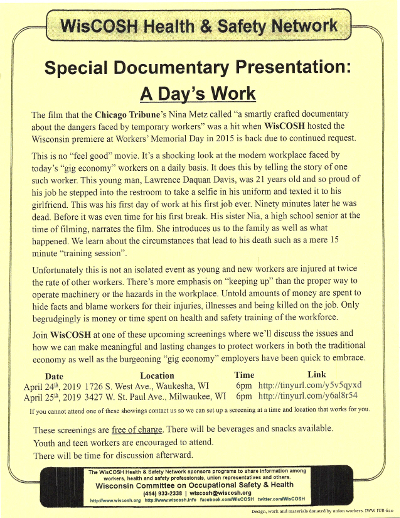 A couple years ago WisCOSH held the Midwest Premiere of A Day's Work at Workers' Memorial Day ceremonies in Milwaukee. It got rave reviews from those that saw it. Since then we've recieved many requests to bring it back. 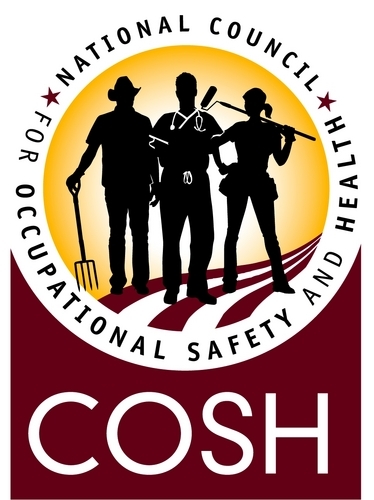 This year WisCOSH is making plans to show it multiple time at multiple locations so that you have as many opportunities as possible to get out and see it. Here is a flier which you can share with friends and coworkers. So far WisCOSH has set up showings in Milwaukee and Waukesha. We would love to set up a showing in your area. If you would like to have a showing, public or private, for your organization please contact us and we'll see about setting one up. Children are welcome but discretion should be used considering topics being discussed. Youth and teen workers are encouraged to come. There will be time for discussion afterwards.